Tasker is quite possibly the most exciting, boring-looking app in existence. A new user stumbling across its Play Store page is sure to walk away scratching their heads, but it only takes reading a few blog posts to realize that there's more to this piece of software than the screenshots would suggest. Out of the box, it's capable of giving users more control over their Android devices than any single other app, but there are no shortage of plugins out there that still manage to crank things up to the next level. The latest update, version 4.5, puts a clear focus on handling locations. 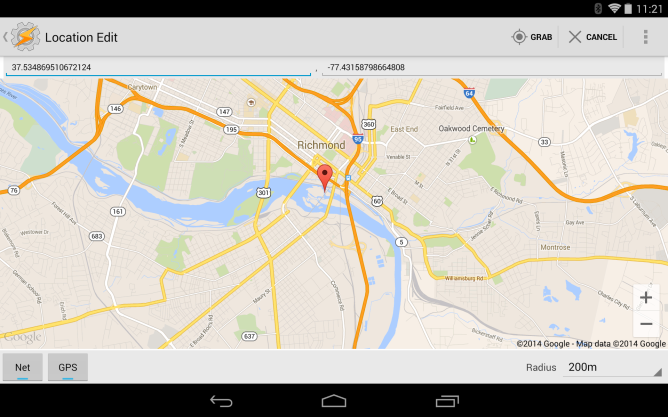 The app now supports Google Maps API version 2. At the same time, a number of location-related enhancements have appeared. Much of this stuff, like everything concerning Tasker, is pretty granular, but one noticeable change is the ability to drag and drop the location marker across a map to specify an exact location. Map controls don't stop there. Users can also toggle a parameter for roads, whether the compass is visible, hide zoom controls, and more. Then there's the ability to look up a location by providing a specific address. Tasker no longer requires Google Maps or Play Services to be installed, but certain features won't be accessible if they aren't. Despite getting top placement on the change log, the new stuff doesn't all concern figuring out where you are. Tasker has added functions for controlling the timer widget, and the UI will default to a dark theme on devices running Android L until the next version of Android is properly released. To really get down in the weeds and see all that Tasker 4.5 has to offer, dive into the developer's full list of changes at the source link below.